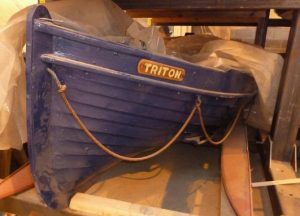 Triton is an open double ended clinker built ship’s lifeboat which previously belonged to the pre-war tug Triton, which in the 1970s was used as a seamanship school in St Katherine’s dock in London. When the school closed the lifeboat was given to the museum. Such craft have a rather colourful history, in one sense going back hundreds of years to the ship’s boats carried by all large sailing craft for general purpose use and as a lifeboat when needs arose, but more recently to the Titanic disaster. In April 1912 the Titanic sank with over 2300 passengers on board. When it became clear that under existing British laws no passenger ship was obliged to carry lifeboats for more than 1000 people there was a public outcry and within months lifeboats like this were being installed on board merchant and passenger ships and passengers were drilled in how to use them at the start of their voyage. Apart from the rope loops fastened externally to assist recovery from the water early lifeboats carried little survival equipment: brandy, fresh water, and biscuits enough for a few days at sea; and sometimes simple oil lamps to be seen by rescuers at night and bags full of oil to calm stormy waters. By the second world war, however, there had been a dramatic improvement and stores included water held in special tanks, milk tablets, dried meat, chocolate and other survival rations. Lifejackets, survival suits, distress flares and hand cranked radios also greatly improved the sailors’ chances of survival at sea. Nevertheless many thousands of merchant seamen died in the war, mostly as a result of attacks on their vessels by submarines, although there are also stories of amazing feats of endurance. Only 18 ft in length and with a beam of 7 ft such craft could occasionally be packed with very large numbers of survivors of shipwrecks.